Over the years, I’ve used several different ways of basing my miniatures, but lately I’ve been settling on a way I’m quite happy with. For as long as that will last, at least :). For the bases themselves, I use standard slottabases (hey, that was the very first entry on TTM. Ah, nostalgia :) ), augmented by some rare earth magnets, though I am now eyeing Galeforce Nine bases, because they come with ‘rubber steel’ inserts to put in your movement trays or transport boxes, saving you an extra order elsewhere. I also like the GF9 bases because they are not slotted. The base above was finished with a few patches of Woodlands Scenics, glued on with gel form super glue. All of my recently finished figures have been based in this way, and you can see the results on my Flickr account. It’s a fast and simple way of producing good looking bases. A future ‘improvement’ is that I will use lighter colors, more tans than browns, to paint the bases, as these look a bit dark when viewed en masse. But as most of my armies have had their bases painted with my current colors, I’ll use the new colors for new armies (Carolingians to start with). I didn’t find the P�b�o mortar in the Brico online catalogue - what’s the price for what quantity ? How does it compare to Coat D’arms Brushscape ? It looks a bit rougher, isn’t it too rough for single figures ? The Celtic Chariot : what are the reins made from ? Beatiful paint job BTW, looking at it almost give me a ‘painters block’. I didn�t find the P�b�o mortar in the Brico online catalogue - what�s the price for what quantity ? I don’t exactly remember, but I think it was around 7 euros for the pot, which is 250mL. How does it compare to Coat D�arms Brushscape ? It looks a bit rougher, isn�t it too rough for single figures ? It is certainly rougher than Brushscape, though it is less sticky, meaning it is easier to apply (it goes where you want it to go, as opposed to where it sticks first). I feel it is fine for single figures, but you can be the judge of that yourself by looking at my latest painted figures in the sidebar - they’re all based with the Pebeo. 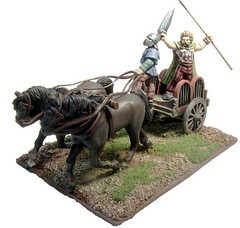 Finally, the reins of the chariot are made from strips of lead sheeting. You can get it in hardware stores (used for roof repairs) or in florists’ (sometimes used for flower arranging, to keep pots watertight). Just cut strips to size with an exacto knife. It also makes great flag material. I’m truly touched and also a bit amazed that you actually listen to me! To take advantage of your current need of guidance from the superior mind (/cough) I’ll pop you another question. What kind of chemicals do you pop to paint a face as on the TTM man? Is there a trick/pattern to it or are your hands just exceptionally steady? Cause I for one also use layering but I never get the end result to look as crisp as yours.